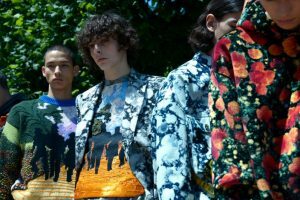 Hot on the heels of the French maison’s latest menswear drop in Kuala Lumpur — here, your complete guide to season’s most hyped-up collection, as told by Louis Vuitton menswear creative director, Virgil Abloh. A portmanteau describing the evolution of an accessory into a garment. In the eyes of Virgil Abloh, bags are the ultimate expression of utility. For Spring/Summer ’19 mens, pieces are derived from the maison’s icons, and transformed via the designer’s 3% methodology. Menswear detailing at the neck, indispensable of formalwear. This season, its tips are clipped — reminiscent of a bookmark. A workingman’s fabric. The designer Virgil Abloh was raised on the Nineties’s washed-out Levi’s jeans. Highlighter-neon hues bring life to utility jackets, shape-shifting harnesses, and accessories. The iconic Keepall gets an update: this time, in prismatic, light-bending hues. Take note: the colours of the collection’s gloves are purposely matched to its leather goods. A term denoting a means of safekeeping, and the conversion of a decorative object into useful ornamentation. Form meets function. Think: modular accessories, and a utility belt featuring three different bags. High-octane bling gets swapped out for ceramics or unrarefied metals, celebrating a contrast of high-low juxtaposition. A mentor and friend to Virgil Abloh. Also, on the front row of the collection’s Spring/Summer ’19 show. Redefining the codes of luxury, Virgil Abloh’s irreverent mix of street and French savoir-faire sets a new course for the maison. “Good style is always off-putting.” – Virgil Abloh. The irony of a generation raised on extravagance, and the make-do and mend sensibility of those with access to it. Inspired by the Wizard of Oz, the collection tells a tale of the designer’s journey from a civil engineering graduate, to fashion’s upper echelons. Namecheck them all within this season’s collection: black, white, off-white, taupe, Ruby shoe-red, brick road-yellow, tin man-metallic, garland-green and rainbow. The approach for this season’s Louis Vuitton men’s Spring/Summer ’19 collection. Looks are designed and styled employing the construction of a top layer, a bottom layer, a mid-layer, and an outer layer. “Revert against stiff and formal. Look as comfortable as you feel.”- Virgil Abloh. Often used to illustrate a state of euphoria, the technique holds nostalgic values to those educated at the University of Wisconsin, the foremost “hippie” college of all time. Though the show was attended by industry insiders, thousands of art students from all over the world were invited, as a means of inspiring youths. The collection’s MVP, as seen on the runway in crayola-bright hues, adorned with multiple pouches, and knitted in cement-grey wool. Bright yellow accents liven up Virgil Abloh’s street-heavy collection, paired against serene blues and psychedelic tie-dyes. Hit the pause button on ageing with these treatments.